Cengkareng, 15 February 2017 – National flag carrier Garuda Indonesia plans to launch direct flights from Jakarta to Moscow in August 2017. Operated by Airbus A330-200, this route will be served 3 times a week.The plan was announced by the CEO & President of Garuda Indonesia M. Arif Wibowo in Jakarta, Tuesday (14/2), at a meeting with Russian Ambassador to Indonesia Mikhail Yurievich Galuzyn and Indonesian Ambassador to Russia Wahid Supriyadi. “We are trying to accelerate plans regarding the launch of direct flights to Moscow in August. 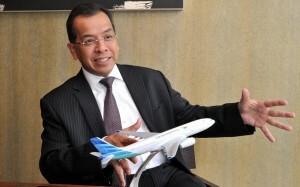 We will fly three times a week using wide body aircraft Airbus A330-200 ,” said Arif Wibowo. In accordance with the potential increase in tourist traffic between the two countries, the direct flight services to Moscow is expected to improve Russian tourist visits up to 100 thousand tourists in 2017.Russian tourist arrivals to Indonesia in the first half of 2016 increased by 14 percent. In contrast, the number of Indonesian citizens visit to Russia is also quite large, in 2015 there were about 14,000 people. Arif added, plans to open Jakarta – Moscow services in the mid-2017 marks a series of Garuda Indonesia international flight network expansion in 2017. In addition to Moscow, in the middle of this year, Garuda Indonesia will also launch Jakarta – Los Angeles via Tokyo. Meanwhile, Russian Ambassador to Indonesia Mikhail Yurievich Galuzyn expected the direct flight from Indonesia and Russia will further strengthen bilateral relations between the two countries, especially in economics and tourism sector.”Realisation of the direct flight plan between Russia and Indonesia has become one of our main priorities in the effort to increase the numbers of tourists visit to Russia,” said Galuzyn. In line with its international flight network expansion program, Garuda Indonesia in 2014 officially joined the global airline alliance “SkyTeam”, in which one of Russian airline “Aeroflot” also become member of the alliance.Through synergies of the SkyTeam airline alliance network, currently all Garuda Indonesia’s passengers can enjoy flight network services to more than 1062 destinations around the world, which is in 177 countries and 17.343 daily flights. SkyTeam airline network alliances currently serve more than 655 million passengers annually.